Thanksgiving was nice. Dad was able to join us and he really enjoyed it especially the chocolate pudding. Today it was back to my chore list. After a leisurely morning, I made it out to my property at 1. I only had 2 chores, cover the water heater door and paint the shed. Of course, I saw a million other things to do once I got there. First, I moved all of the things that would rust in to the greenhouse or if they would deteriorate in the sun then I moved them to the shed. I couldn't just throw them in to the shed so I had to organize it. Some things went in to the back of my truck to give away like the extra microwave and some tires. Then I checked out my driveway to see if the rain did any more damage. It looked ok but I saw 2 shovels in the wash (that's the dry creek bed) so I went down there to pick them up (probably from the neighbor kids) and then I started trying to re-stack the tires. I'm always afraid that I am going to run in to a rattlesnake down there but hopefully they are sleeping this time of year. I moved 3 tires, which were much heavier than I expected. I want to get a load of dirt delivered so that my driveway will be wider. When the people who bought my RV drove it out I could see the tire tracks really close to the edge of the cliff. It is about a 10' drop off. I am so glad that there isn't an upside down RV in the wash right now. 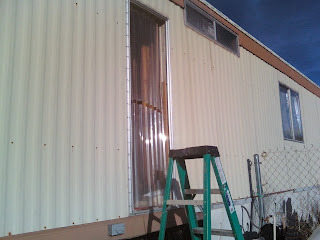 After that little side trip, I got back to my chores and I managed to attach 2 plastic panels to the doorway. There is a slight gap in the middle but the top one overhangs the bottom one so it should be ok. If the wind doesn't rip it off, it should protect the closet from most of the rain. While I was fixing the doorway, I was right next to the jacuzzi and the top has been eaten by the sun. The only thing left was the styrofoam so I took it off to see what gross things were underneath. There was 18" of water and a dead scorpion. I didn't want to leave it uncovered so I broke the edges of the styrofoam until it fit inside the jacuzzi as a floating cover. I don't know what I will do with that jacuzzi or if it still works but that's a problem for another time. 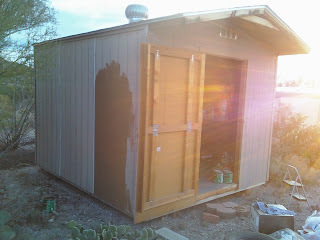 Finally, it was time attempt to paint the shed. I found many cans of paint and one of them looked like a nice brown color. First, I caulked the edges that were getting water damage. The sun was going down but I wanted to start the painting. I only painted one 4'x8' panel but at least I started it. Hopefully, this time I will finish painting within the next few months, unlike last time. I painted most of the 3 sides in a sort of rose color. This time I must finish! Let's see, when will I have time to get back out there... Well, tomorrow I will be visiting my mother again. I could go out on Sunday but I would really like a day at home. Next weekend is busy, the weekend after is the company Christmas party, and after that, my nephew will be here (hmm...I wonder if he likes to paint?). Things aren't looking good for this year but next year is wide open! Nothing wrong with child labour. Get your nephew painting!! 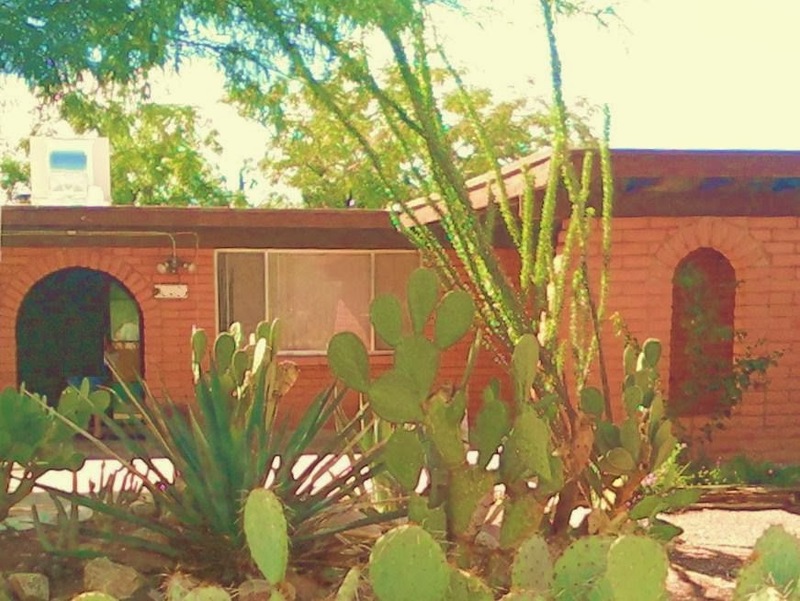 My mother volunteered to help too but I don't know if I want to risk her falling in to a cactus. Kids LOVE to paint. I agree with Lizzie! Indentured servitude of your kids is the best. Also, I think you'd done great with your goals this year. Look at all you've gotten ride of out at your property. Things are moving along at a pace you can handle. Keep at it!!! Yes! Now hopefully the weather will cooperate for painting but that is a lot to ask for since it is December.